These are photographs taken over the last two weeks. 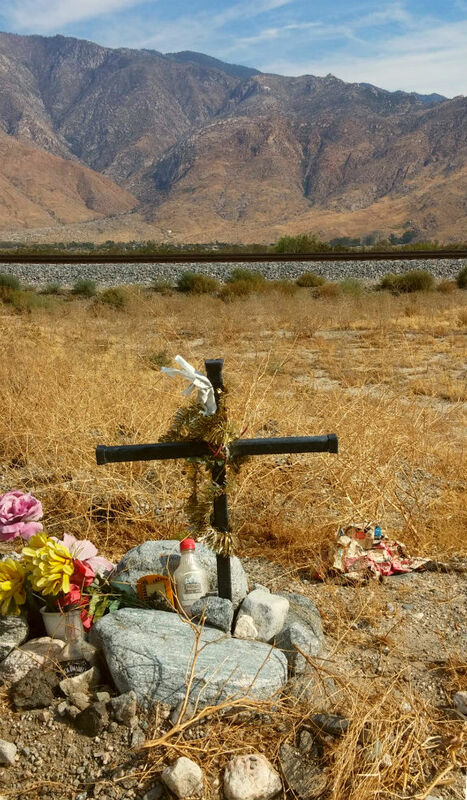 Ken and I stopped on the frontage road to the 110 freeway near Cabazon to look for the memorial for Jimmy Marquez Fisher. I saw him lying on the highway the night he was struck twice and killed. See Friday Night Lights. Ken is sending me some of the other photos we took as my camera was acting up. The notes attached to the makeshift cross are from his sister. 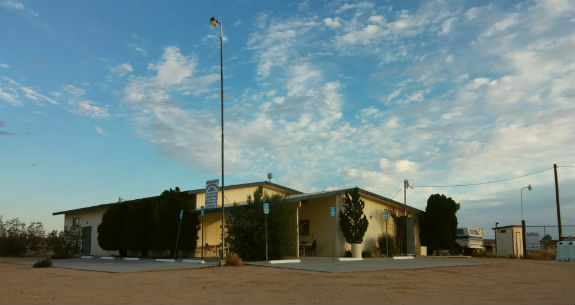 This is the Copper Mountain Mesa Community Center in North Joshua Tree. Copper Mountain Mesa is actually its own county service area, CSA, and Mary Helen Tuttle is the MAC (Morongo Basin Municipal Advisory Council) representative. She is also the angel of the CMMCC. After serving breakfast at the Copper Mountain Mesa Community Center's First Saturday breakfast we drove to our house in Wonder Valley. 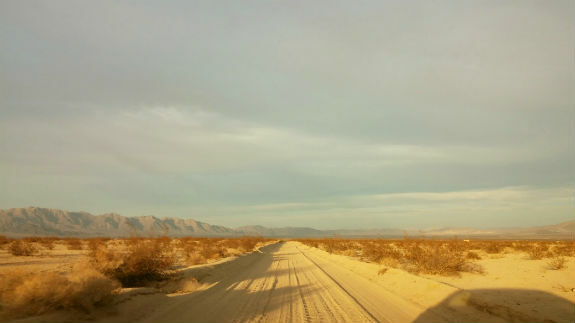 This is one of the roads we take. People ask me why we bought a house out here. This is one of the reasons. It's even more remote. Once you get bit by the "remoteness" bug you just want more. 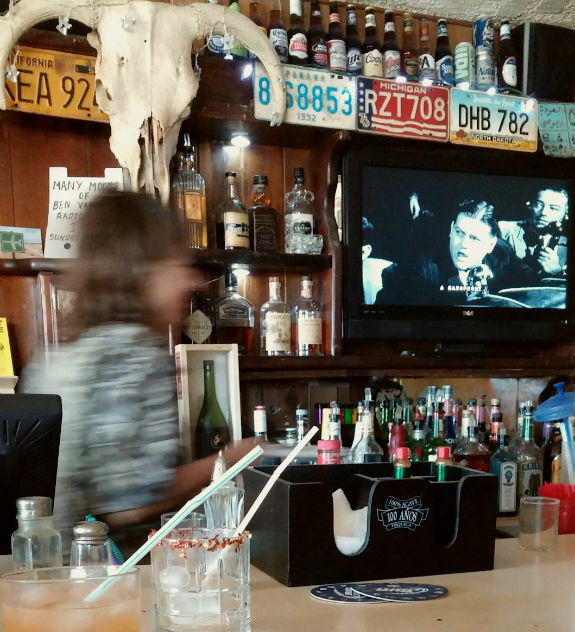 This is another reason we love Wonder Valley: the Palms Restaurant, Mary Sibley (zipping by in a blur) and Laura and James Sibley who make up The Sibleys, the bar band. Great bar. Great people. Great food. Great prices. Great live music. You get the picture. This is looking at the north of Amboy neighborhood from Highway 62. It's nestled at the base of the Bullion Mountains. 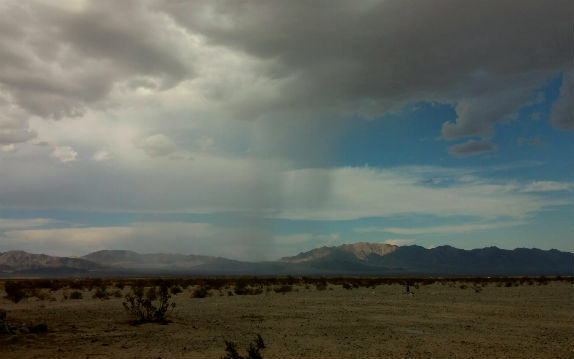 There's a sun shower on the left. I hadn't noticed this when I took the picture but I think those are two funnel clouds forming to the right of the shower. A tornado touched down that day and destroyed some fencing and tore up some roofs, though there were no reports of injuries.